You're Invited: Gina K Designs Release Party Tonight! Good morning, I'm so excited you are here! The Gina K. Design Team is honored to invite you to another fabulous Release Party tonight!! The party starts at 7:00 pm Central Time in the Stamp TV Release Party Forum. Please join us for Challenges, Contest Questions, Design Team Samples, Full Stamp Set Reveals and, of course, party chit chat!!! Everything will go "live" at 7:00 pm Central in Gina's Store, so there won't be any long wait to start shopping! Hope to see you there! Now please visit our newest Gina K Designs team member Lori McAree's blog to continue the hop, and we'll see you tonight at the party! Oh, sigh, this Blogger thing has just given me fits this week! I am so sad to hear that all of you who follow me through a reader (thank you!) don't have any new posts showing up for the past two weeks, UGH! What to do?? Anyway, I'm going to go ahead and draw a winner from my blog candy last week, wish we'd had more entries, but it's time to move on because we have a new Gina K Designs release tomorrow and Inspiration hops starting up! The whole team will have link lists and I WILL be posting the next four days so please be sure to check it whether your dashboard shows I have a new post or not, I appreciate it! There will be more candy offerings coming up so please stop by and enter! Congrats, Alex, please send me your snail addy and I will send you the set! See you all tomorrow, I'll be sharing a peek of the first card I designed with my new set this month "Stately Flowers 3". So excited! Any guess what flower it might have on it? Thanks for stopping by today, are you ready for more beautiful stately projects from Patti Gilliam? On this sample, Patti chose to use just the single blossom from the hawthorn in "Stately Flowers 2" to create a pretty border along the top, popping each one up so they stand out like embellishment, isn't that sweet? Last I want to point out how nice the pink decorative border inside is, not only for the design but for staging purposes! It looks so beautiful the way the pink at the bottom inside balances the pink on top in this photo. She has another project on her blog along with step by step tutorial pics, so please check it out and leave her some love. Thank you again, Patti, for being my guest designer this month! You rock! Well, it seems things are starting to sort themselves out with commenting and feeds for my posts, please bear with me, I'm at the mercy of "the blog"! (and sounds like many of you are too) I'm going to leave the candy from the weekend open just a few more days to give more people a chance to view it since some still aren't receiving updates. I sure hate not knowing who's here and who isn't and miss hearing from so many of you, too! You can enter on this post. More design spots on their blog will be coming up over the next several weeks, I hope you'll become a subscriber! PS One last bit of trivia, I have a card on their cover this month, that's the first time that has ever happened, I was just tickled pink! Do you know which one? PPS Gotta give a shout out to all my Gina K peeps (Jennie, Carolina, Michelle, did I miss anyone?!) 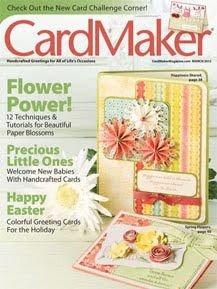 who are rocking cards in this issue (woot!) as well as few a cards I can't help mentioning that use my stamps (yippee! ): Tonya Dirk made an adorable one using "Candles on your Cake" on p.50, and Giovana did the cutest baby card with "Basket Blessings" on p. 72. Thanks so much ladies!! I believe I will keep the blog candy below open a few days beyond Monday, because it is clear from emails and info I have that people are not seeing my new posts right now. :( Please email me if you know if there is some setting I need to change on my blog to correct the problem, because we have a Gina K Designs release and blog hops coming up, yikes! I need to make sure my blog is in peak functioning form! Thanks in advance! I wanted to go ahead and share a link today to book I just saw that is offered FREE for a limited time on Kindle: "The Decaf Diet: Is Caffeine Making You Fat?" Now, I have not read this book, but I did give up caffeine about 6 months ago (and noticed SO many positive changes in my health as a result: not overeating, not craving sweets, not getting headaches or having trouble sleeping, feeling more alert and even tempered, etc) but judging by the positive reviews on Amazon, I would encourage you to read this book and learn more about the harmful effects of caffeine. I was not a coffee drinker before, but I did drink a lot of diet sodas, and now I drink just plain old water and a variety of delicious decaf herbal teas*, don't need or miss the caffeine at all. It sounds like the author includes several decaf plans: cold turkey, decreasing your intake over time, and optimal caffeine use for those who'd like to continue with caffeine in moderation. Any of these changes would be really beneficial! Please pass that info along to someone you think might benefit from it! Anyone else have a positive "I kicked caffeine" story to share? I'm all ears! This blog candy is now closed now, see this post for the winner. Leave me a comment telling me...what set you'd like me to stamp with and post next! I'll announce a winner Monday. Tonight I will be stamping with Marita and other ladies at my church as we kick off our card ministry: a way to fellowship with one another, reach out to others, and cover our church and other causes with cards. (Please pray it goes well, I haven't done anything like a home workshop in over 4 years lol!) We plan to meet monthly and instead of reinventing the wheel and stressing over what to show and help people make (like I used to when I was a demonstrator!) my plan is to follow my "A Year of Flowers"book each month! We will be doing a few variations of cards from my January and February sections as time allows, and I plan to bring a lot of different colors than what were in the samples for different looks and so they can be used in other seasons so the church will have a stash. I spent so much time making sure there was a variety of techniques, color styles and layouts already, I might as well "go by the book"! Gotta go cut some card stock now and make banana bread, I'll try to take photos so I can show you us busy stamping next week! :) We will be meeting monthly so if you live in the Austin area it would be a pleasure to meet you, let ! I do expect over time our group will outgrow Marita's accommodations and we'll be meeting in a larger area. Let me know fi that is something you'd be interested in. This would be a great way for you too to plan a girls night or stamping group who intends to meet regularly: there are three layouts, designs and color combos per month, plus techniques that you can build on so those in your group gain more knowledge, experience and confident throughout the year. It's also perfect since the months designs are arranged by holiday, we'll be creating exactly what we need at that time. Just a suggestion! That it only uses one the set of images too is bonus so you aren't needing a lot of different supplies. 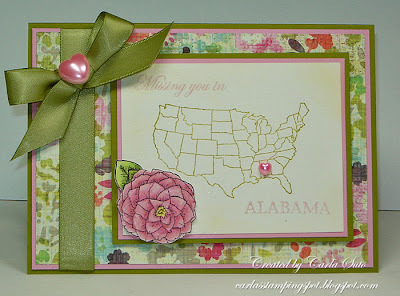 Well, imagine my utter delight and surprise when I opened a card Patti made for this week's Stately Flowers 2 guest post and saw one that was so strikingly similar to a layered camellia card I made ! :) Hey, it happens, were we on the same wavelength or what? There are many differences about this card, though, that I'd like to point out and think work really well. Instead of an embossed frame, she drew her own with a pen. Even with the realistic flower and very classic fonts, the hand drawn border works great, not just for whimsical images and fonts! The use of Kraft instead of black. I tell yo can use Kraft with anything, love it here with the pink and white. Pearls in the corners. This really dresses that sketch frame up! The black bordered ribbon really makes all the other black details and lettering pop. Gorgeous card, Patti! Please sure to leave her some love today, aren't you enjoying her guest spots this month? Hello! 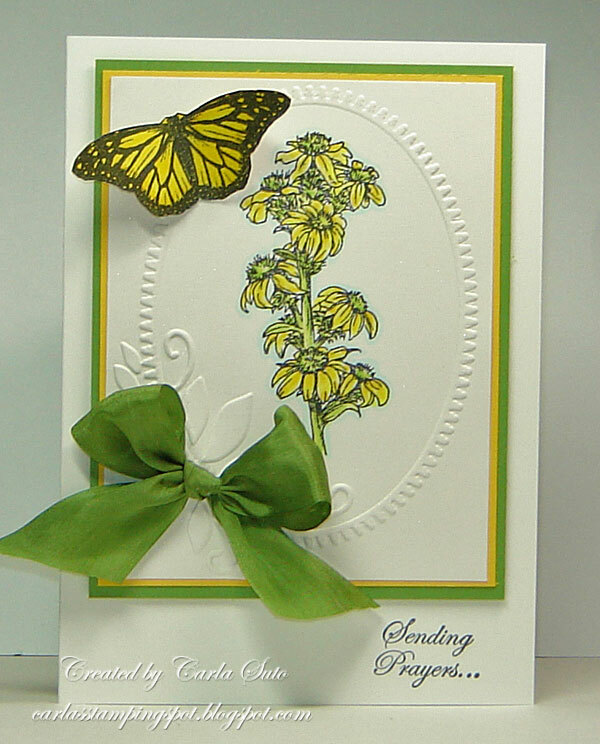 Today I have another lovely "Stately Flowers 2" card to share from Carla Suto. Be sure to leave Carla some love today! Thanks Carla for another stately beauty! So excited, the books arrived at Gina's store, you can now purchase my "A Year of Flowers" book on the Gina K Designs site, I know a lot of you were waiting for that! Remember shipping in the US is free when you place an order of $50 or more!